As an amateur astronomer I’m not having much fun in these weather conditions. But one must find the good in bad, so sitting at my computer I’m experimenting with some of my older lunar images. 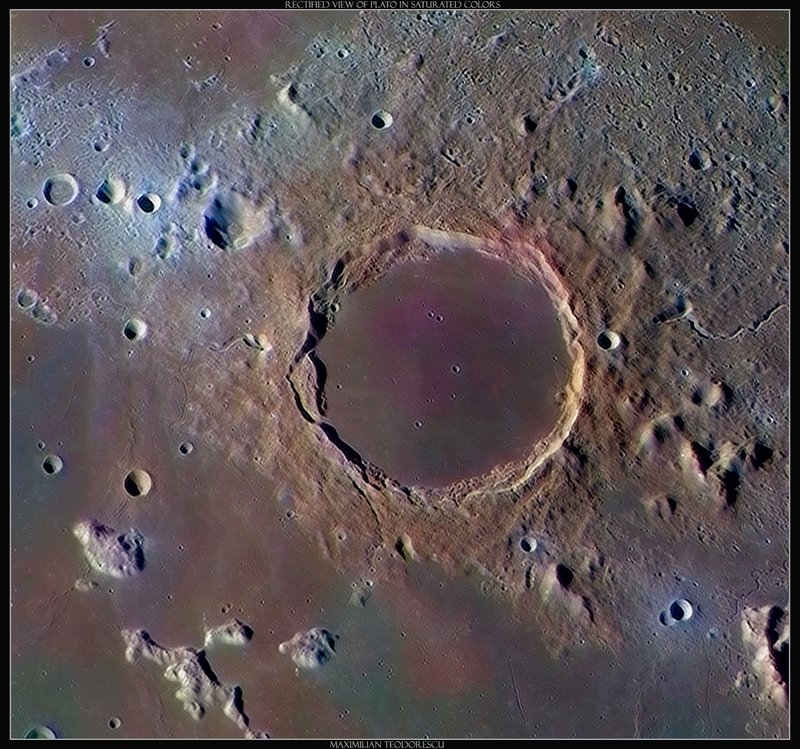 One way to experiment is to try and improve yourself at image processing; another way is to learn new software. Well, this time I’ve selected the second way. It’s been a log time since the FREE (!) LTVT software is around, and I must confess I’ve never used it until now. It is a very nice little software that can do apparent miracles with your data. Combined with the FREE (again!) 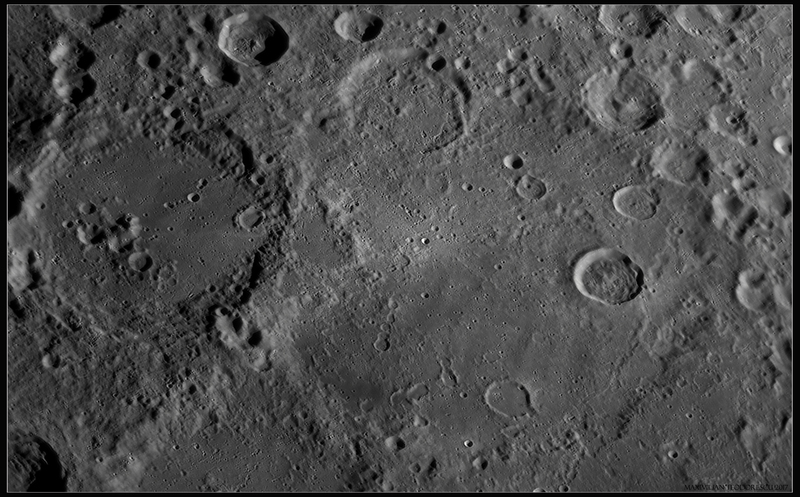 LROC QuickMap this software allows an amateur to view his images under a corrected aerial view (and many other things, but this is what I did for now). Something that until today I was trying to do manually in Photoshop (and almost every time it did not go well). 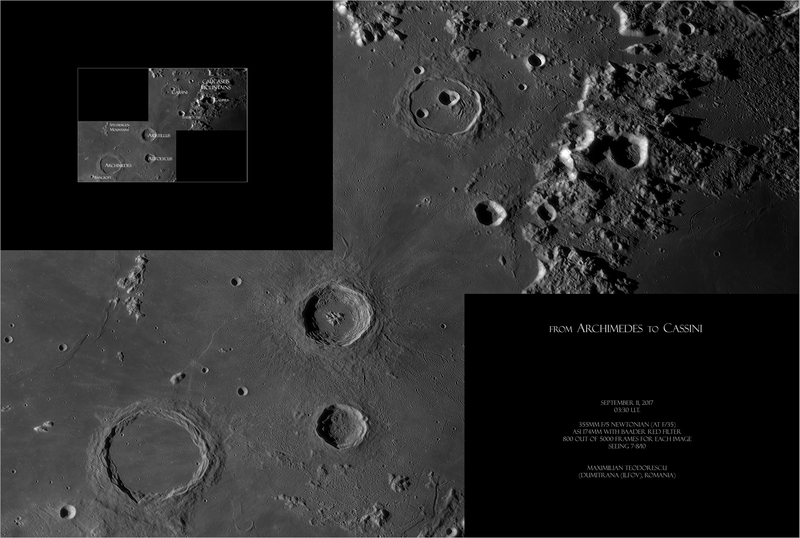 The best part is perhaps that these two tools (LTVT and QuickMap) are so easy to learn and operate that in about 10 minutes I was already creating my first good quality aerial view of the lunar crater Gassendi. 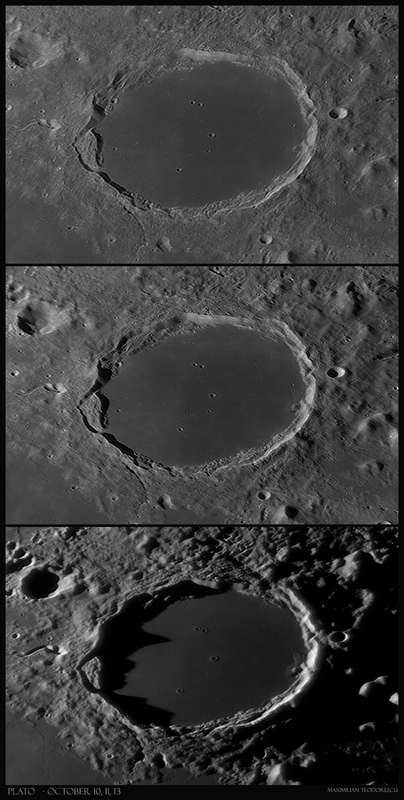 This post presents the results obtained after processing some old images of this crater. 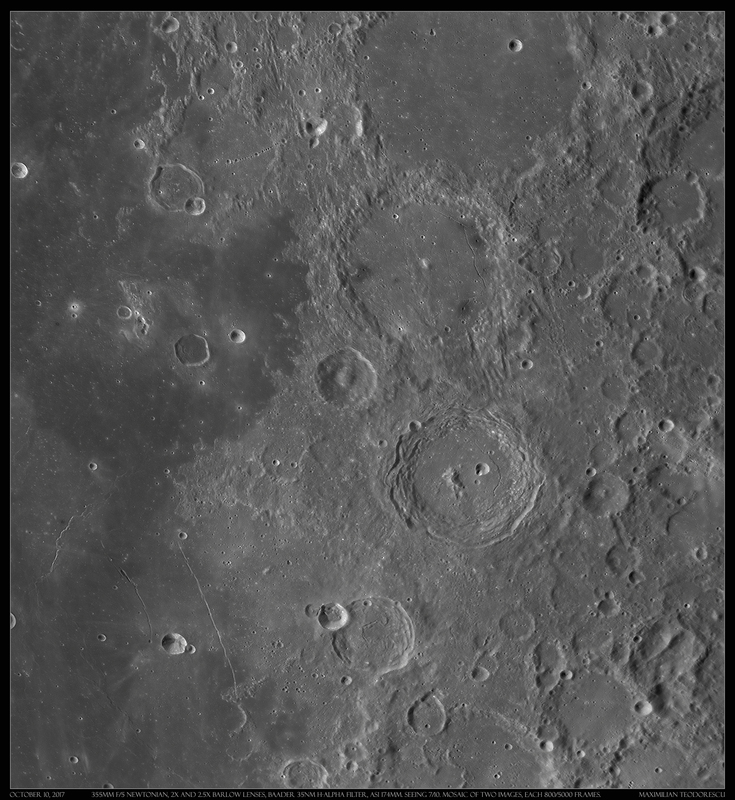 The image above was acquired on March 20, 2016 with the 355mm Newtonian under pretty good seeing conditions. 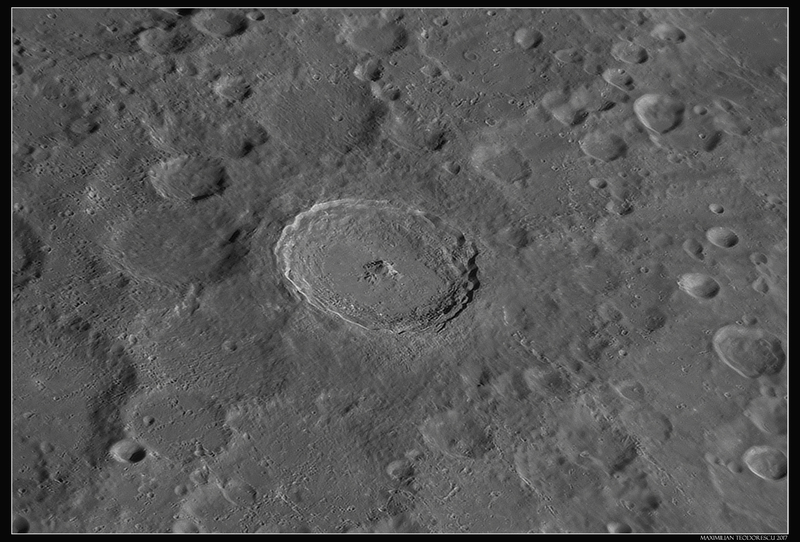 A number of small rilles are well visible in and around Gassendi. There is one rille of just 450 meters (!) 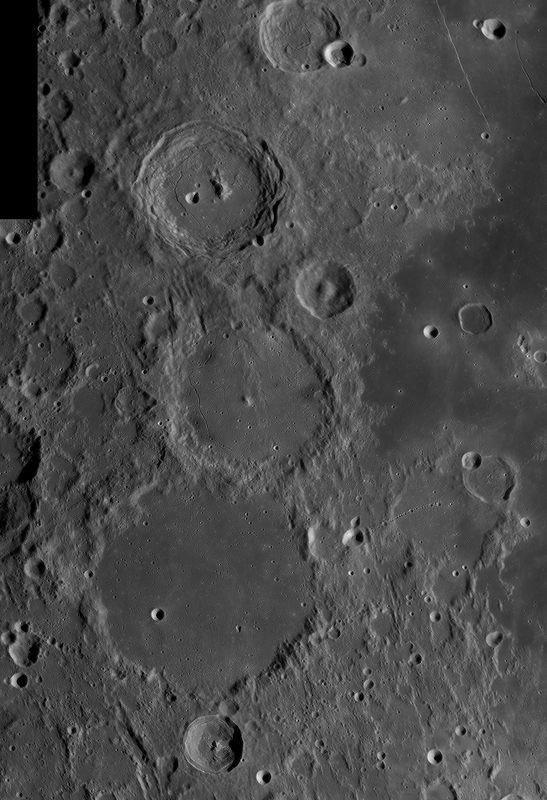 wide crossing a dome on the lower part of the image. 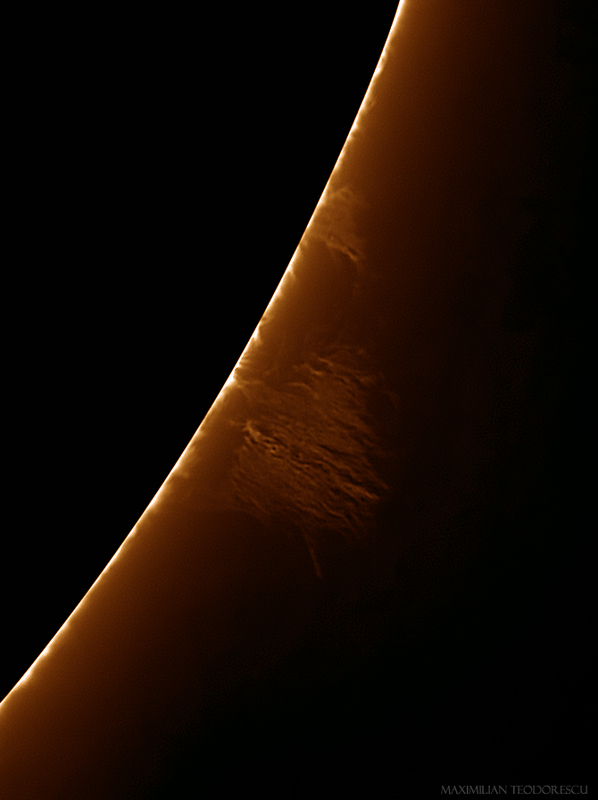 This view shows how the area is normally observed from Earth with a telescope. 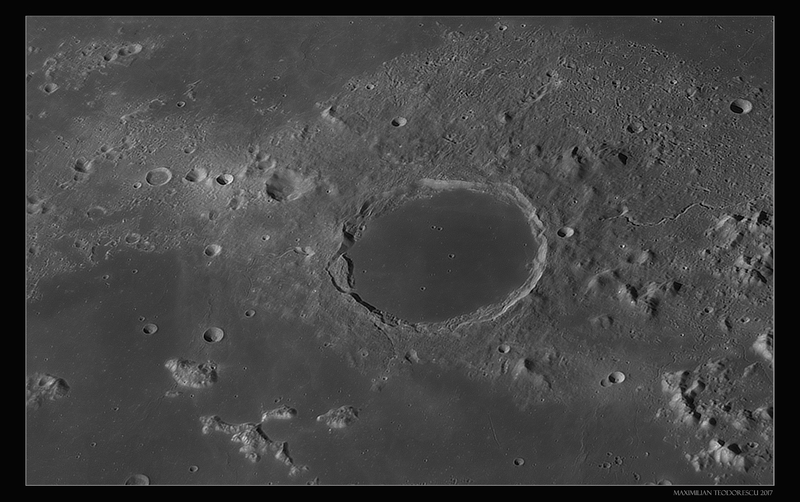 The craters are viewed at an angle due to their location on the Moon. 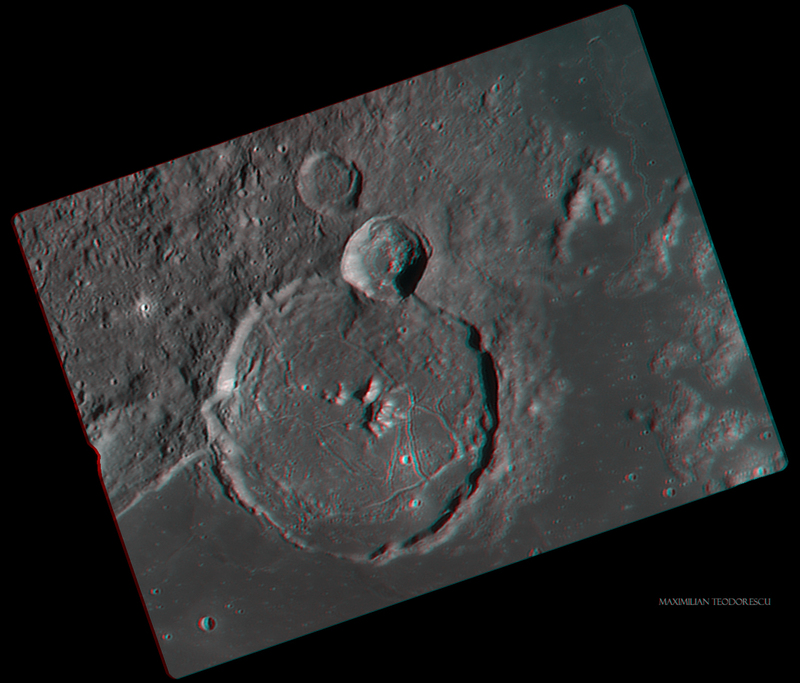 The most striking feature that is now obvious is that the central mountain is not directly in the middle of Gassendi’s floor, but slightly shifted to one side. Next, I was hoping to create a tridimensional (3D) image of the area, using another image of Gassendi under a very similar illumination. This second shot may be found here. 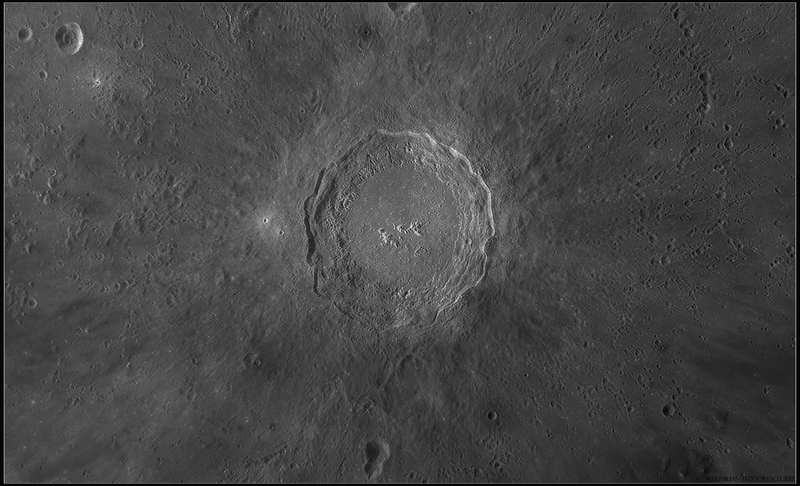 These first results using the LTVT software show me just how much more I can extract from the lunar shots I have acquired until now. 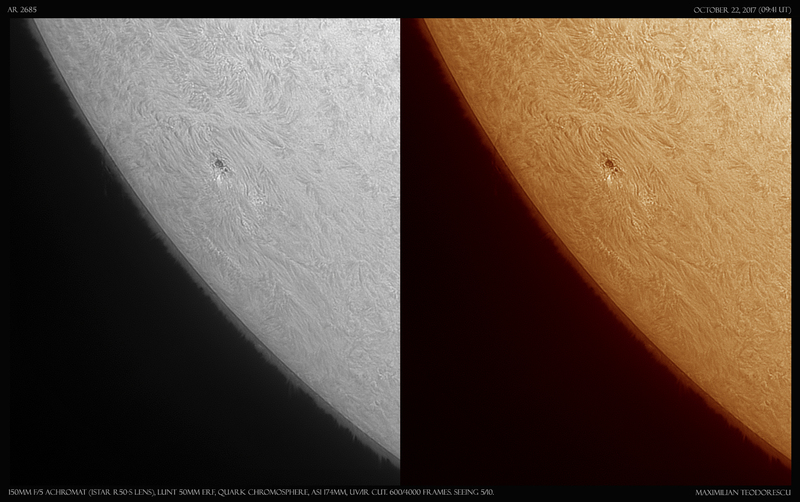 Sometime in September I’ve decided that an upgrade for solar imaging is a must. The goal of such an upgrade would be to have a very portable yet powerful scope that can be easy to set up and without many of the problems encountered with other instruments I have. I’ve concluded that a diameter of 150mm is the minimum, and that the instrument will be a refractor due to lack of the collimation procedure required with a Newtonian for example. Other optical systems were considered but my budget aimed at a homemade instrument. That, again, pointed at an achromatic lens. 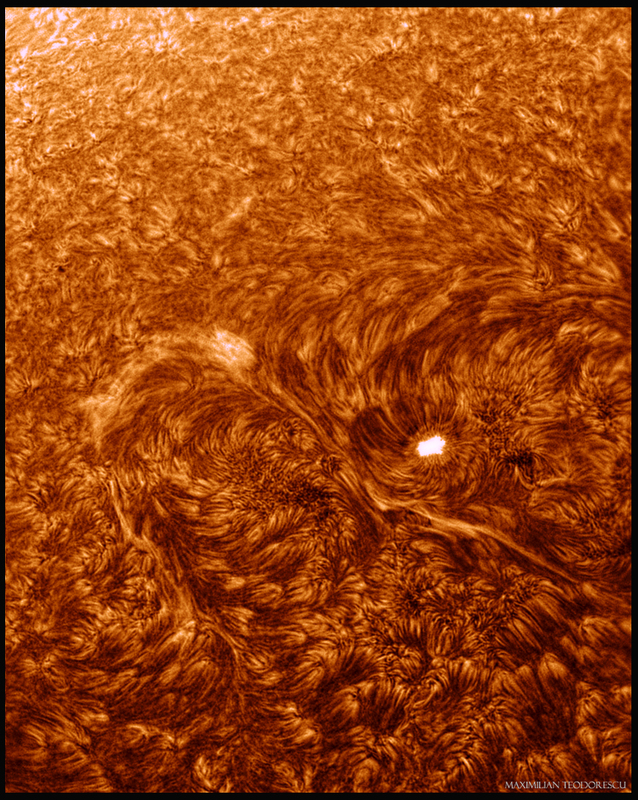 The main purpose of the instrument would be H-alpha solar work, but with the ability to do some white-light solar imaging also, and the occasional ISS transit. 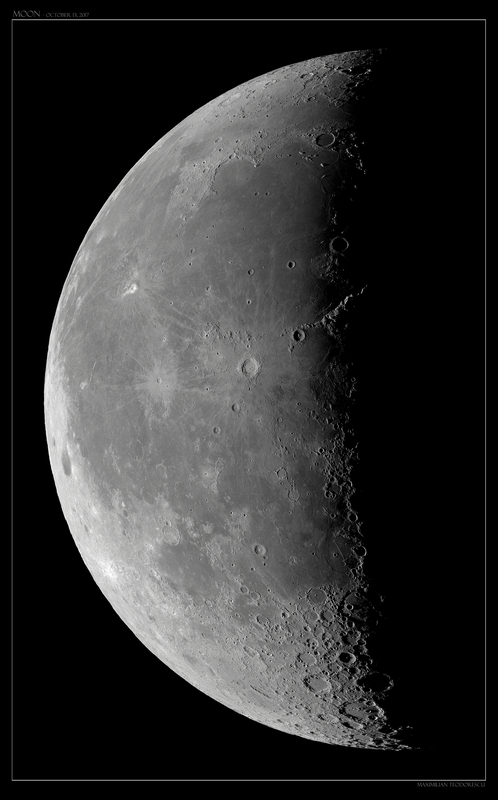 The Moon would also be fun for such an instrument, and perhaps some deep-sky views at the eyepiece. I’ve decided that I should go with the iStar company (US based) and their 150mm F/5 achromatic lens. Unfortunately this lens was not on stock, so I’ve reconsidered and selected an improved version, an anastigmatic R50 slim lens. 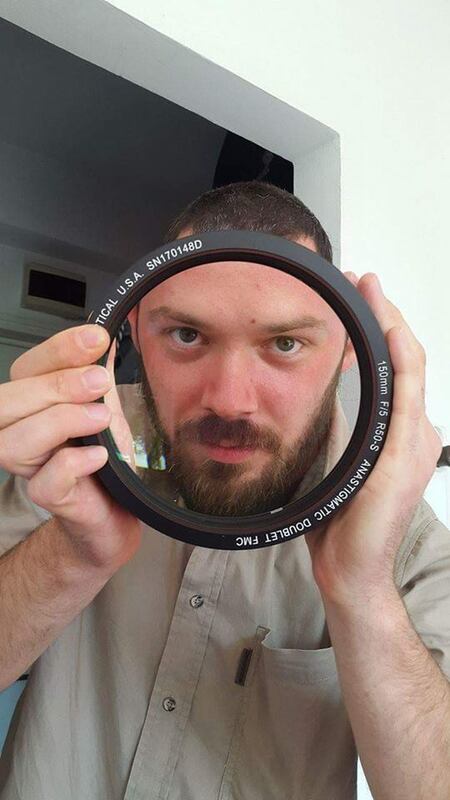 I was hoping that by the time the lens would get to Romania the instrument’s frame would be completed. 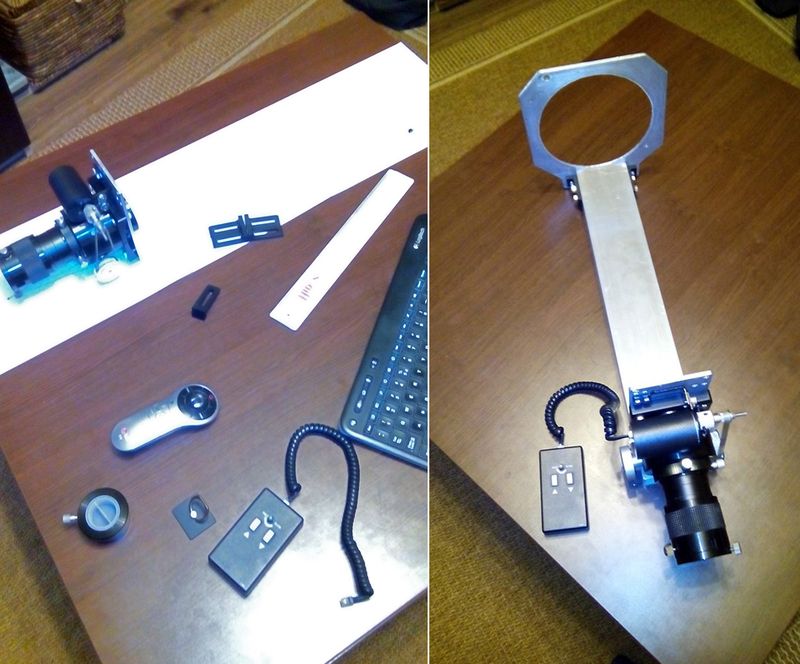 So…I had one month to put on paper, select materials, build components and assemble the “thing”. September 22: The design was more or less selected. Initially I’ve built the lens and focuser flanges by hand, using an aluminum plate and sawing by hand the desired shape. I was not happy with this setup, so I’ve decided to get some proper flanges built using Laser-cutting techniques. The process took quite a while, so at the end of September I was still lacking the main parts of the frame. October 5: The new flanges arrived. 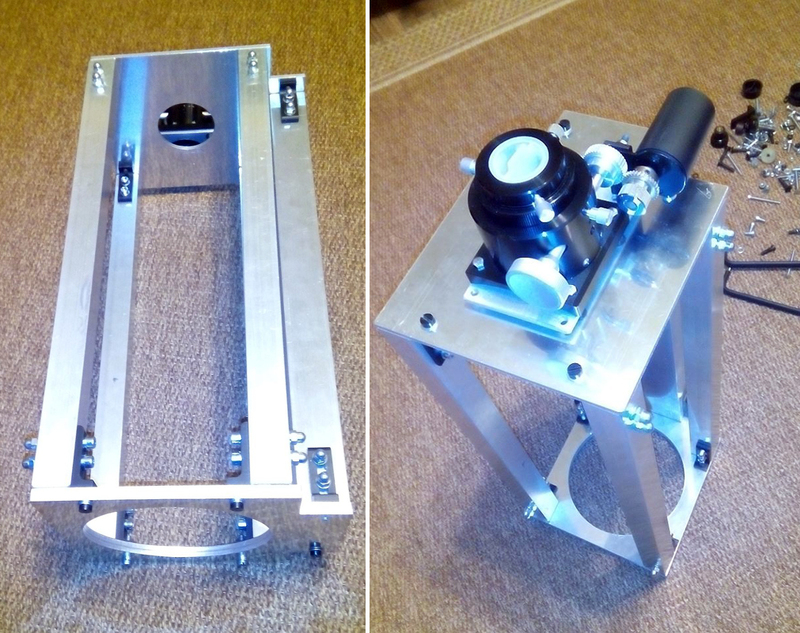 Using some new components built the days before, I’ve assembled for the first time the frame of the instrument. The focuser system was also modified, with the electric motor now connected to the focuser by a pair of toothed wheels. 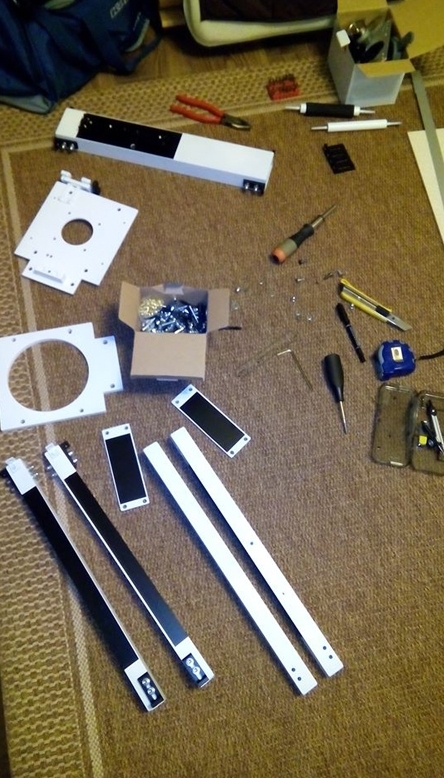 A few more components had to be built by hand, and aligning/realigning the frame took some time. 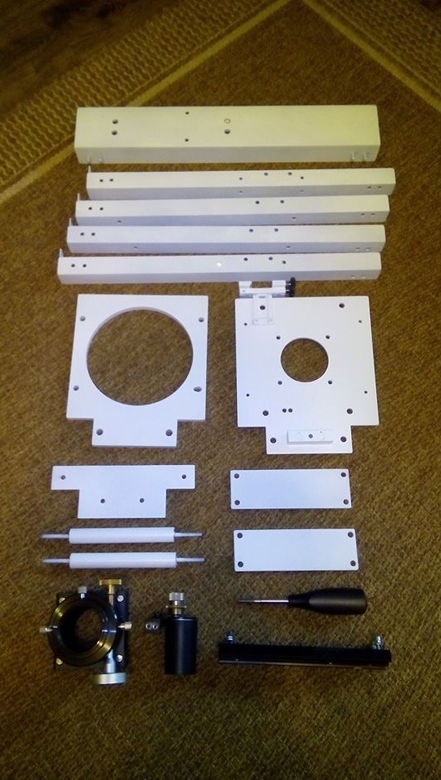 Finally, the components were now ready to be permanently assembled. 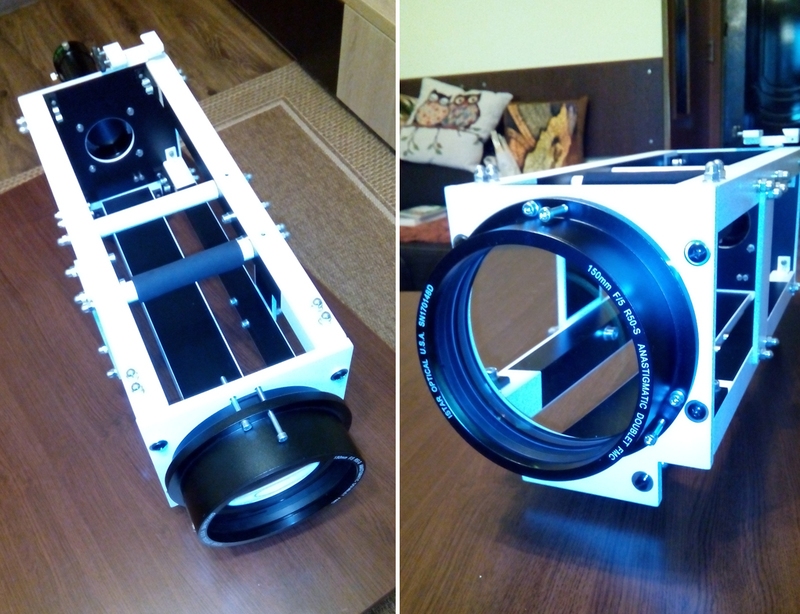 Verifying the alignment showed me that the frame was stable and could now receive the main component: the lens. Thanks to my friend Vlad Dudu for this shot. Of course I’ve rushed back at work, drilled a few more holes, and went home only to start the final and most rewarding procedure: “put a lens on it”. Now, this strange-looking piece of aluminum, was finally looking almost like an optical instrument. The Lunt 50mm ERF filter was also housed into a homemade cell, and mounted on the focuser; one more component finished. Next phase: tests. Under the stars at first, to have a proper collimation and some first views of the sky. 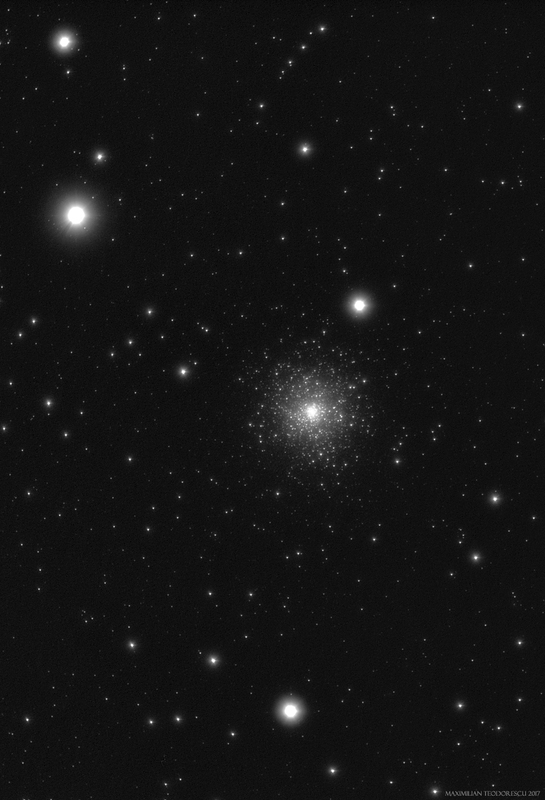 Pretty nice for a 6 minute-equivalent shot under poor conditions. This scope proves to be a very fast one. 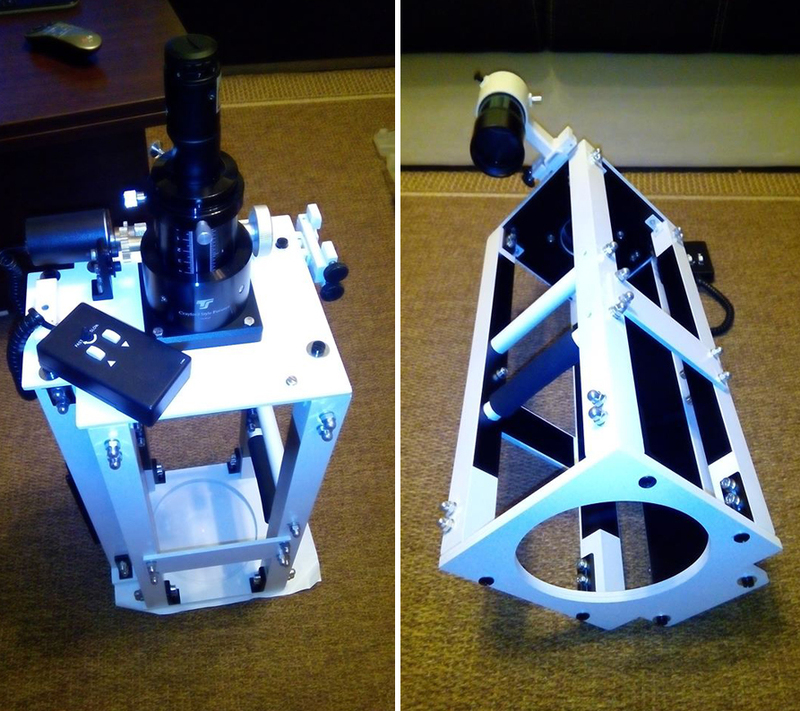 I still have to build a dew shield, a shroud and some lens caps, but the shape of the refractor will not change. 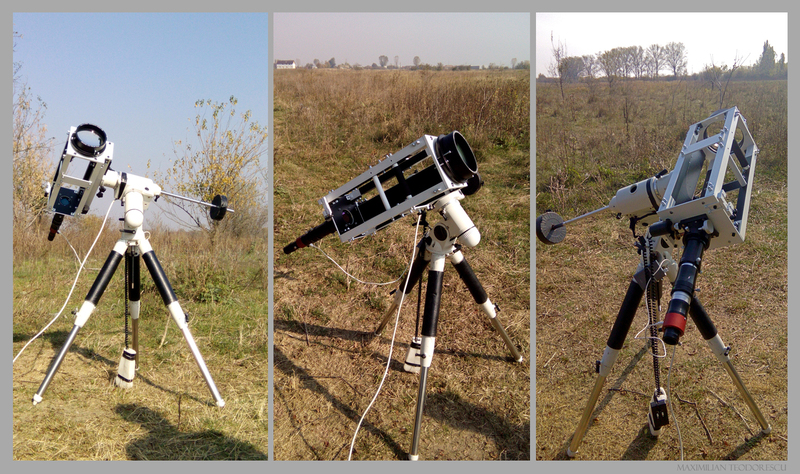 At the end, I can say that this 1-month project was very rewarding, as I could build the frame in time to receive the lens, and also test the instrument just before the arrival of a bad weather front. 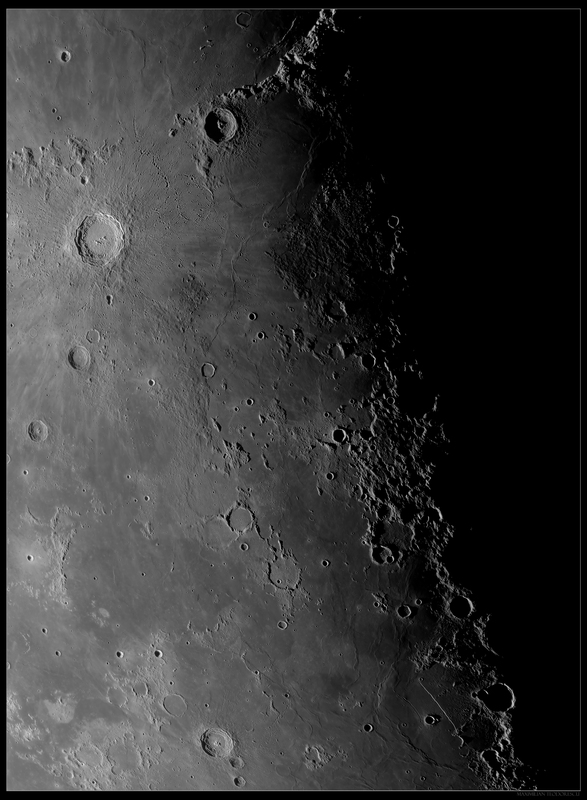 A few lunar shots from October 10 acquired under good seeing conditions with occasionally very good moments. For some of these shots the jetstream was a problem, but luckily only for about a quarter of the session. 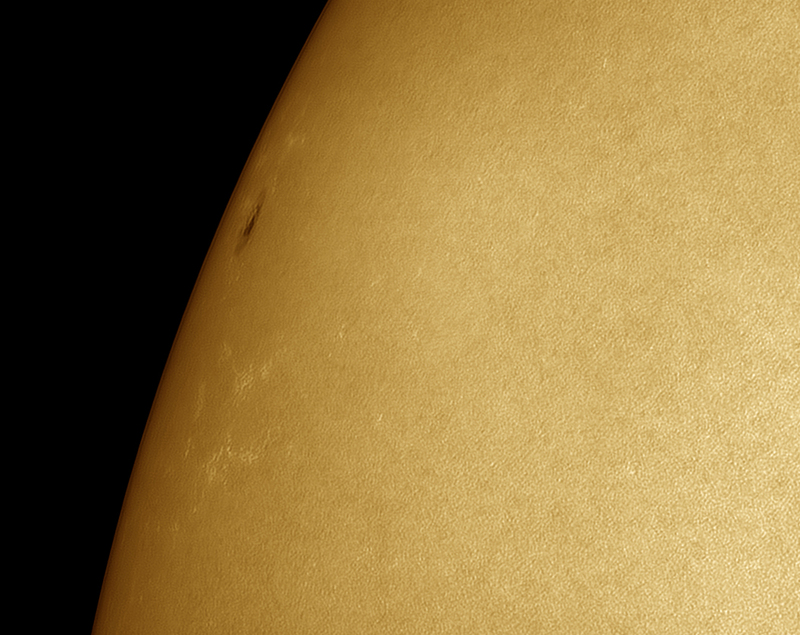 This session was around 4 hours long…with breaks due to poor seeing and a few clouds. Equipment: 355mm F/5 Newton, ASI 174MM, Baader red filter. 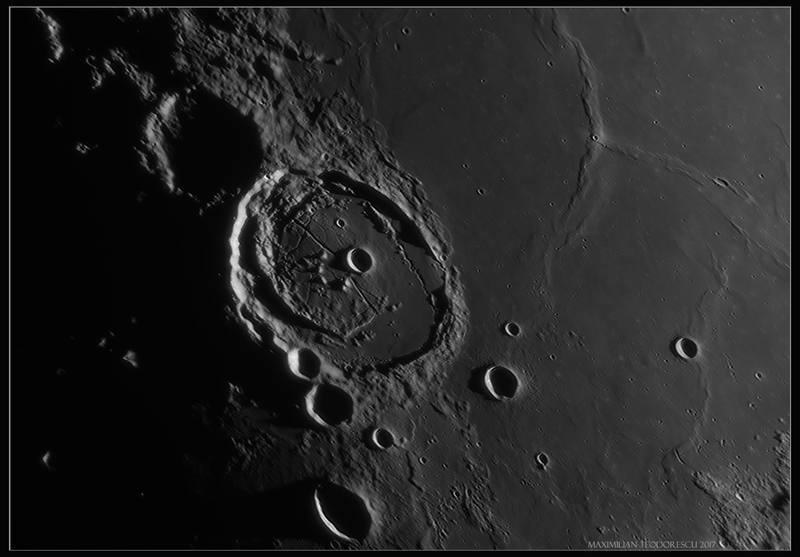 On October 10, 11 and 13 this year I had the luck of some good to very seeing conditions while imaging the Moon. 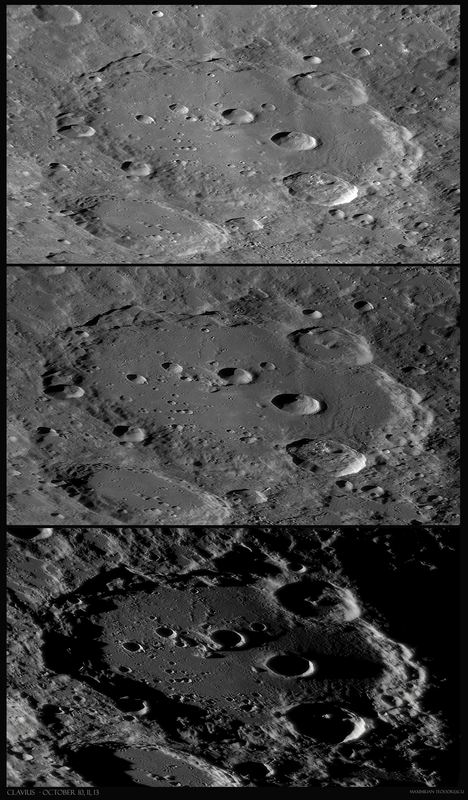 Following are three sets of images for three well-known lunar craters: Plato, Clavius and Tycho. 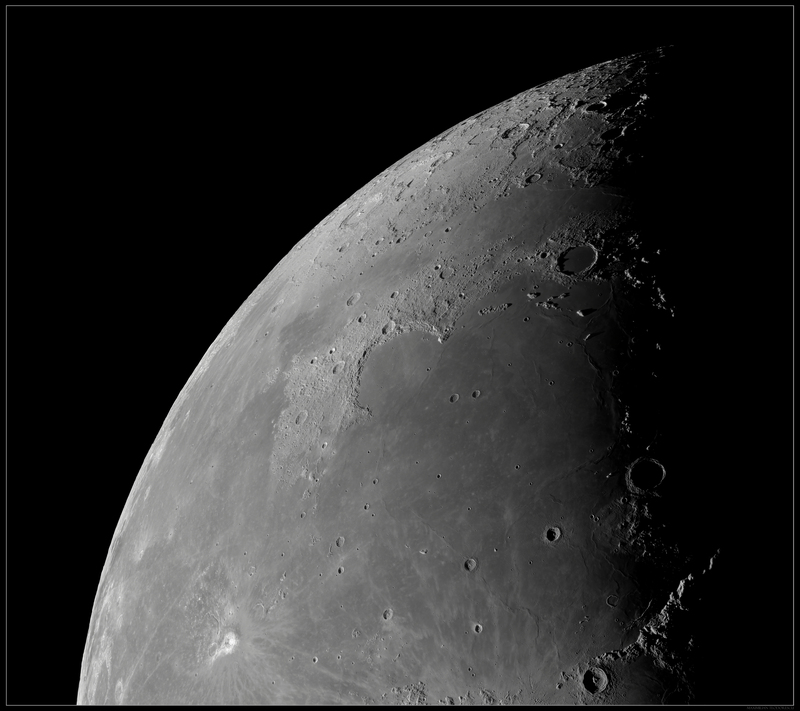 On October 12 the clouds did not allow any lunar images. 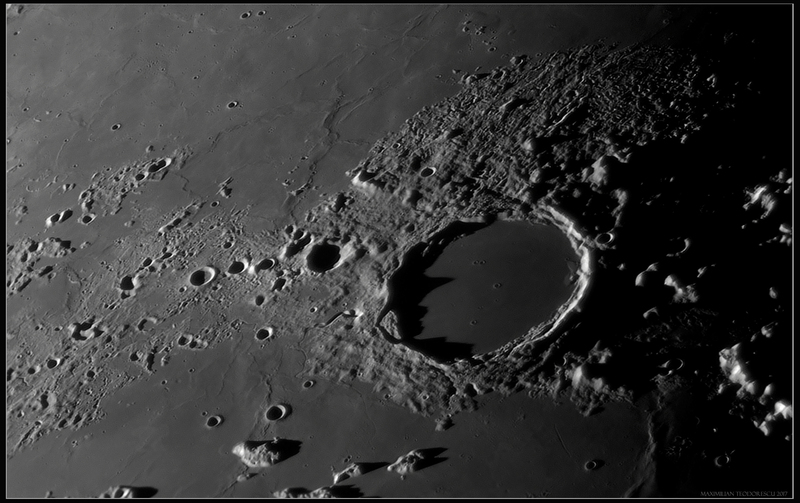 Equipment: 355mm F/5 Newtonian, ASI174MM, Red filter. 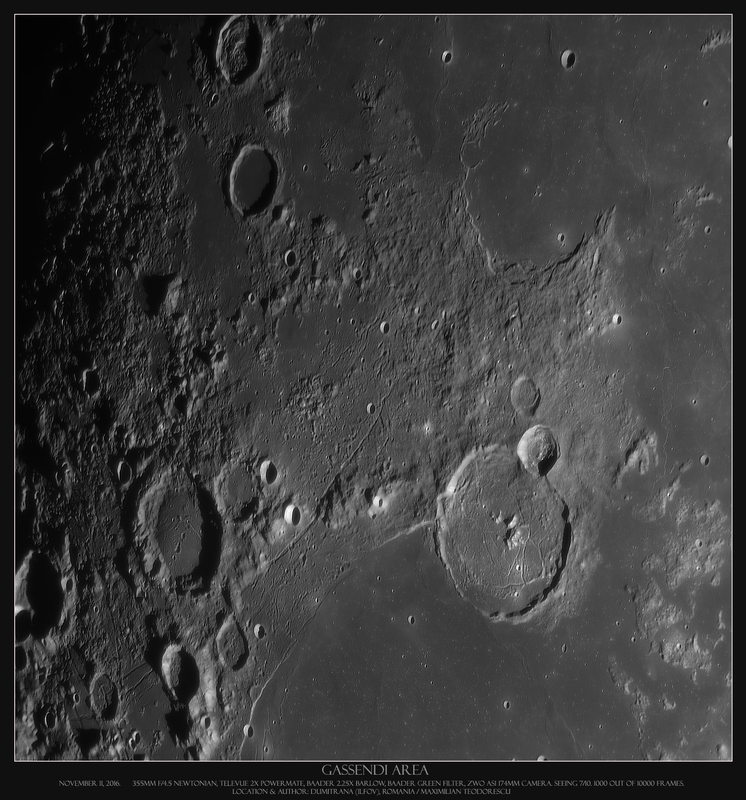 A very frustrating lunar session this morning, with mostly fair seeing and the occasional very good to excellent moments. The problem was that the seeing was very good or above only when the wind was blowing from a certain direction, which also had a negative effect: dew…So each 1000-2000 frames I had to clean the secondary mirror, which slowed the image acquisition process quite a lot. Nevertheless, a few nice results emerged. 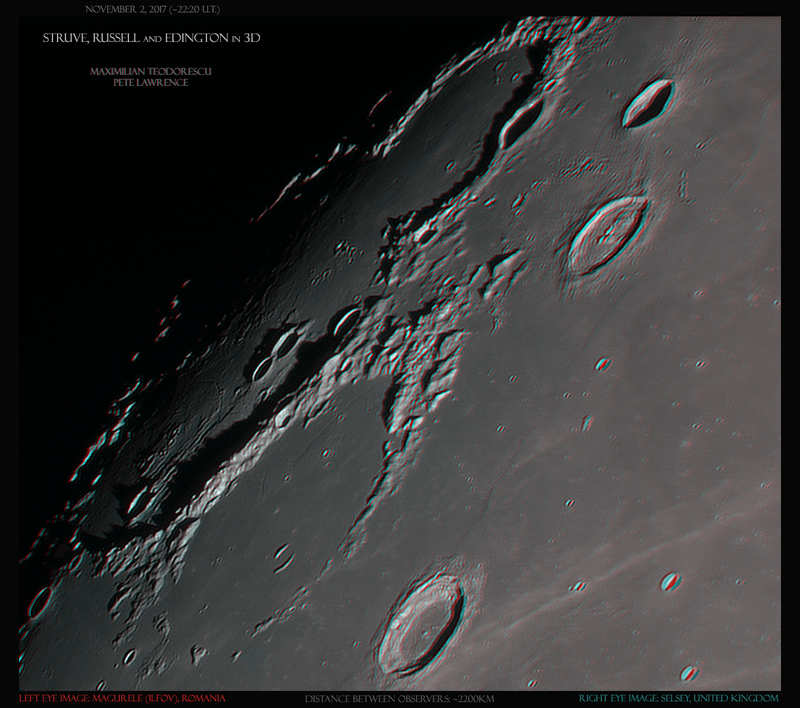 Some of which are my best shots of the imaged regions. 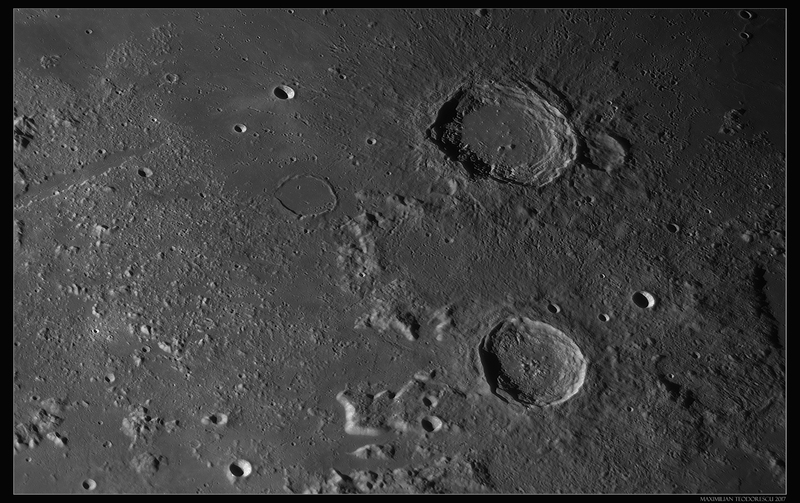 Equipment: 355mm F/5 homemade Newtonian, 2.5x and 3x Barlow lenses, ASI 174MM, Red filter. Seeing: 6-8/10. 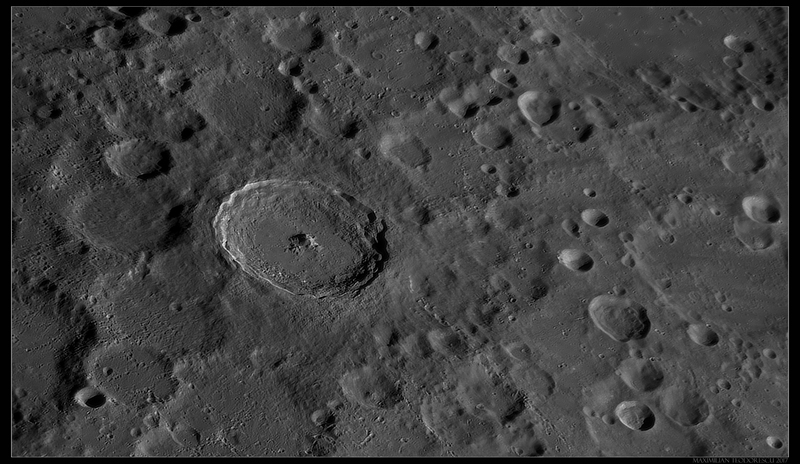 The image above shows the region under almost the same illumination as an older image of mine (from 2013, acquired with the C11 SCT), which at the time was also an LPOD. 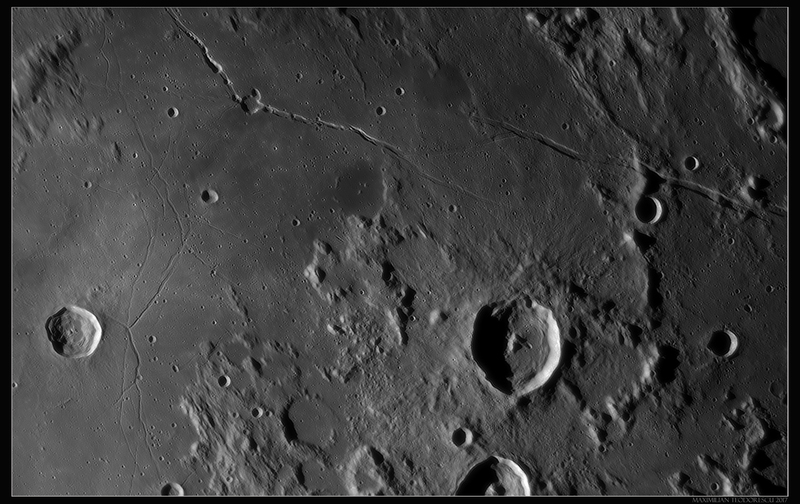 One of my favorite craters: Pythagoras. 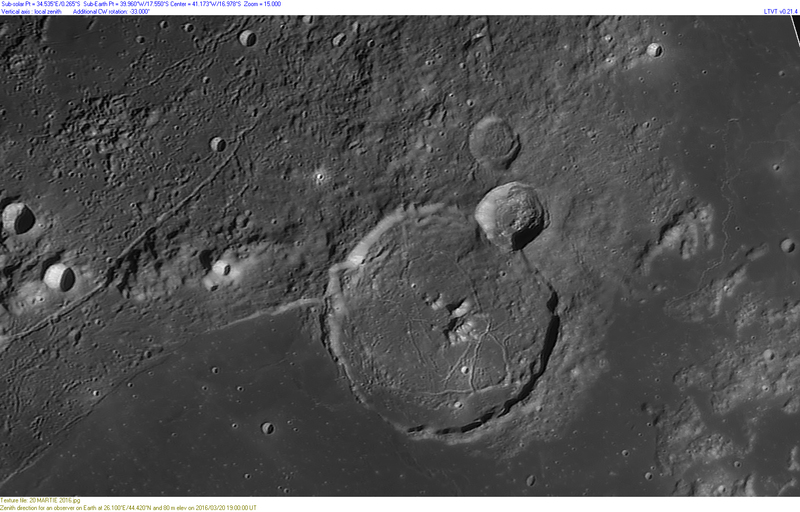 Craters Pitatus with its complex floor rilles, nearby Hesiodus with two volcanic calderas, and the concentric crater Hesiodus A. 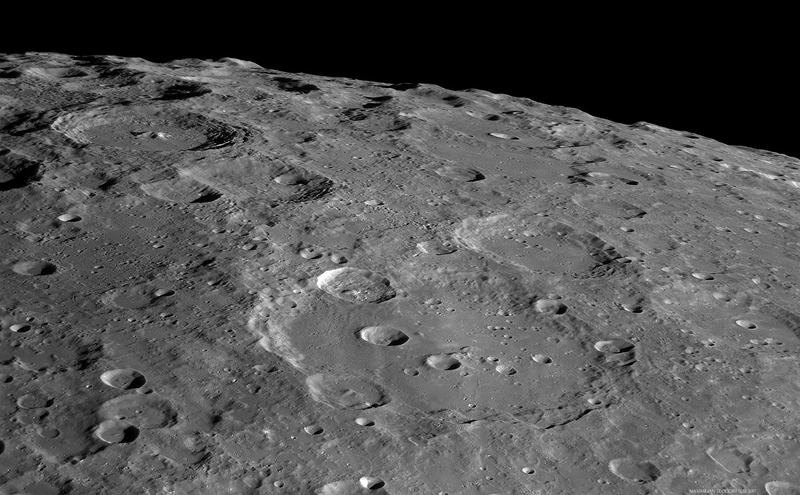 Also, a highly enhanced view of the same image, showing the inner terraces of Tycho, visible by the reflecting sunlight coming from the opposite walls of the crater. 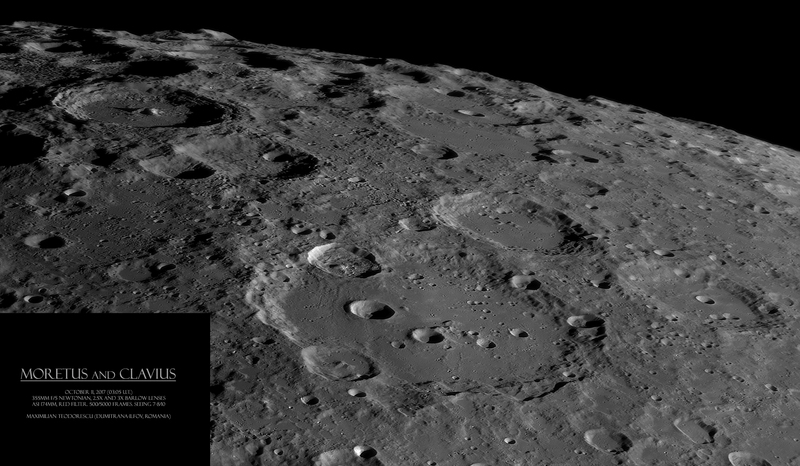 I had had to sacrifice the normally exposed lunar surface in order to see “inside Tycho”. 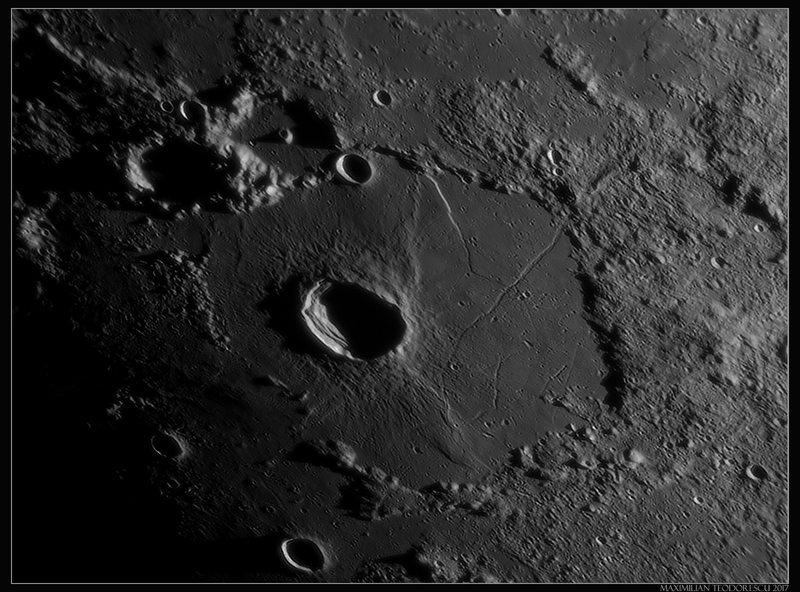 On this session, just before all of the above images were acquired, I was also trying to get a full-phase lunar mosaic. 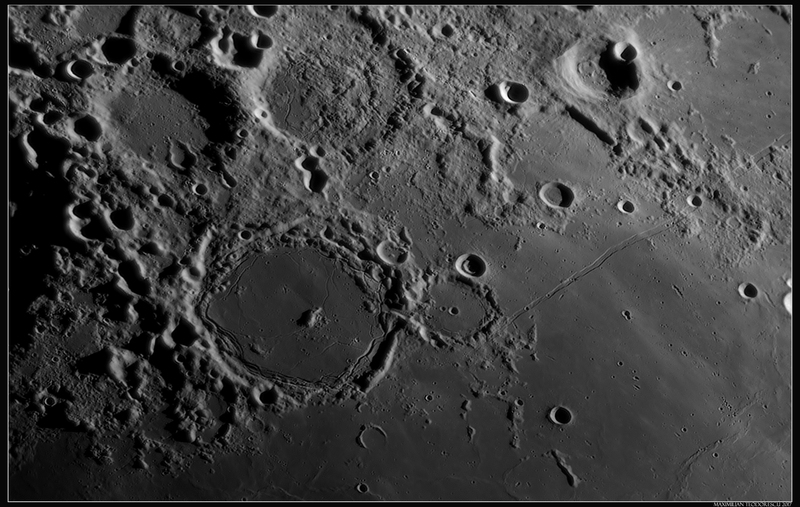 Unfortunately the seeing at that moment was rather poor, so only half of the mosaic turned out OK. Due to this, I had to resize the final image down to about 30% of the original. 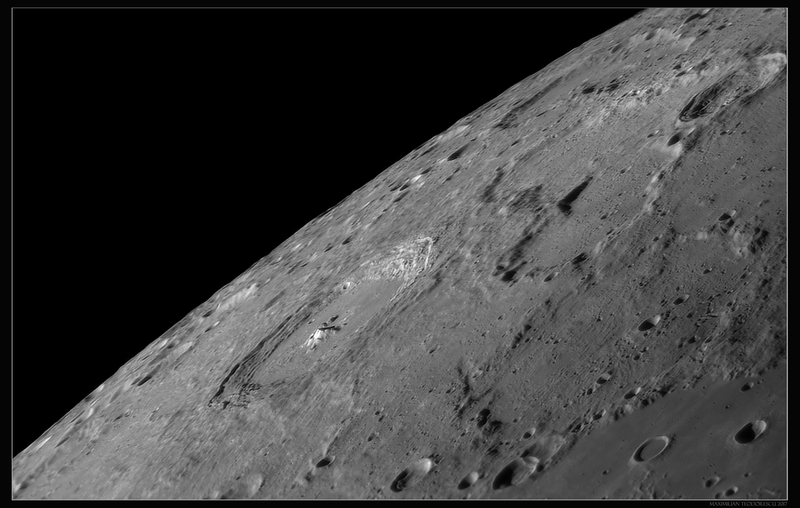 Many areas on the full resolution one are quite blurry so shrinking the image was the only way t go. 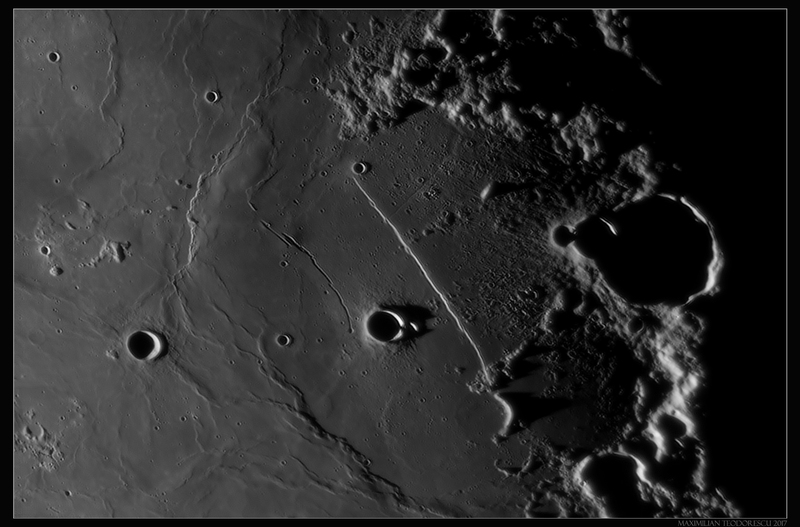 And two full-resolution areas of the mosaic under 6/10 seeing conditions. This was my motivating phrase for today’s lunar session. At only 2 degrees Celsius and lots of fog, the imaging conditions were very good, but for a human that is also not used to get up very early in the morning (at 3 a.m. in this case), they were not so…comfortable. The phrase in the introduction was, of course, modified from John F. Kennedy’s speech before the start of the Apollo Program. His original phrase is one of the most memorable ones for any lunar enthusiast: We choose to go to the Moon in this decade and do the other things, not because they are easy, but because they are hard (September, 1962). 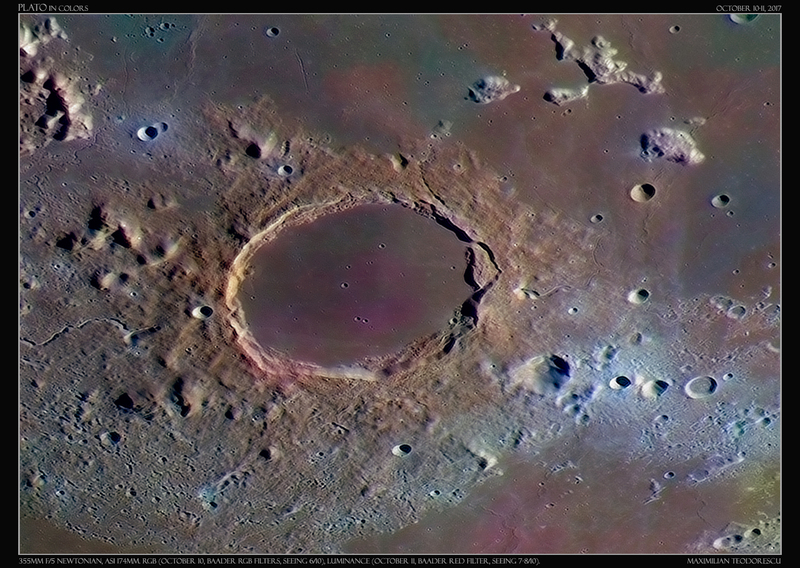 One imaging project that was on my “to do list” for some time: crater Plato in RGB colors. 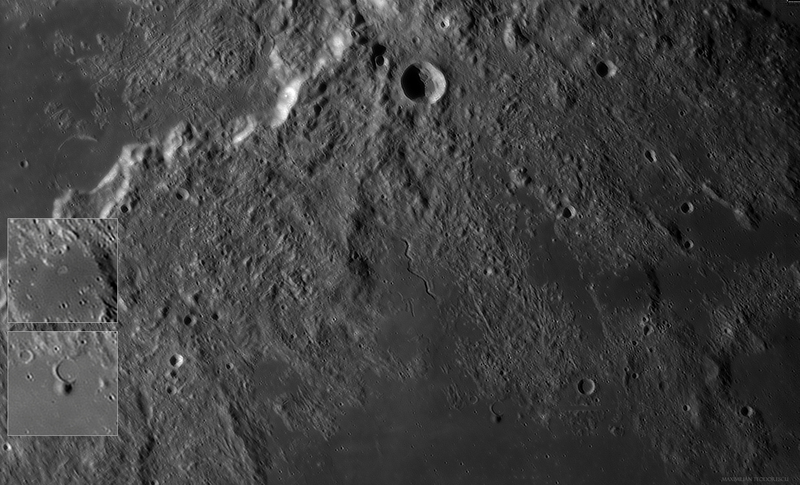 The following image was combined from the October 11 Luminance image (acquired in very good seeing conditions) and the October 10 RGB data. 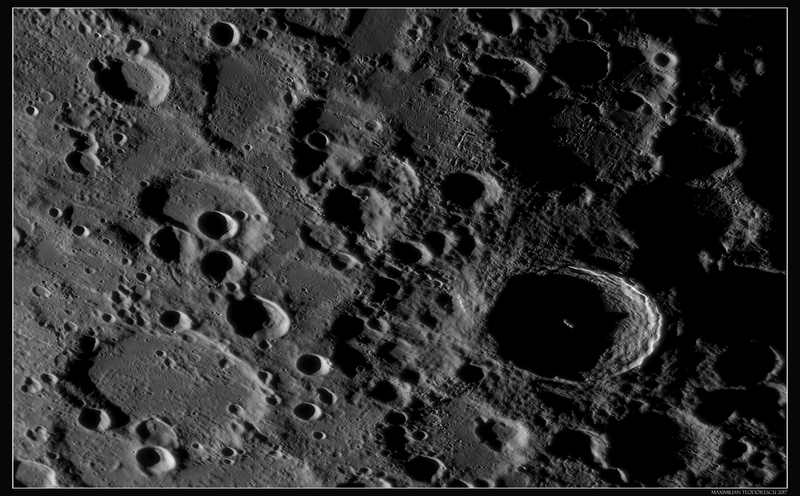 This was rather difficult to do since from day to day the libration changes the aspect of craters quite a bit, especially towards the lunar limb. 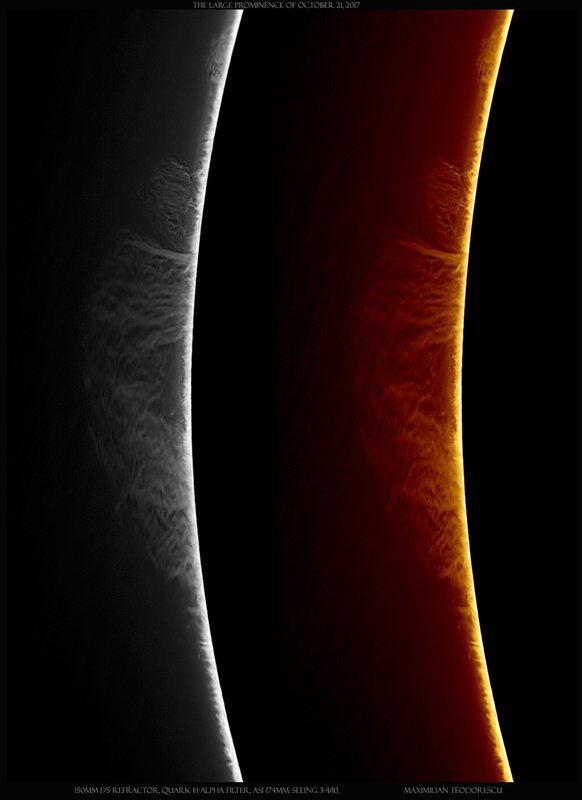 Nevertheless some good color data was extracted, in high resolution also. There are a few large purple areas on the floor of Plato that are in contrast with the surrounding regions. 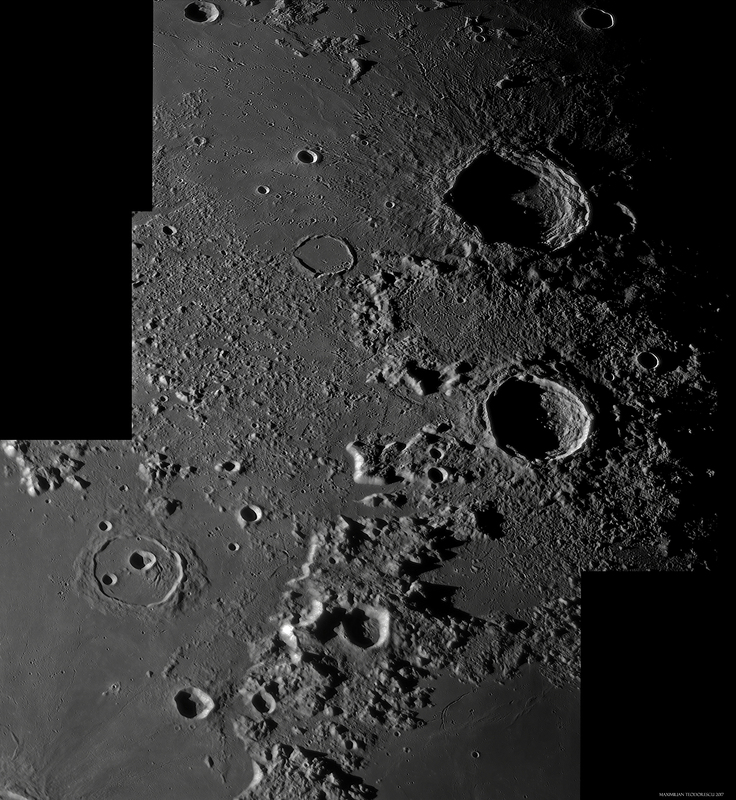 One large mosaic showing the Alpes Mountains, crater Cassini (lower left), and the very photogenic couple Aristoteles (up) and Eudoxus (center-right). 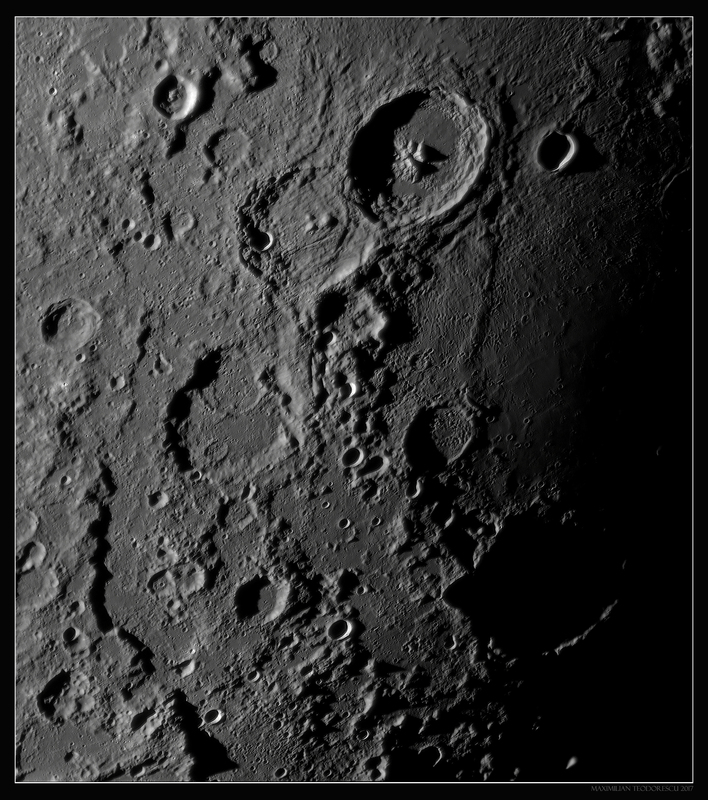 This region is filled with high contrast features when the illumination is right. 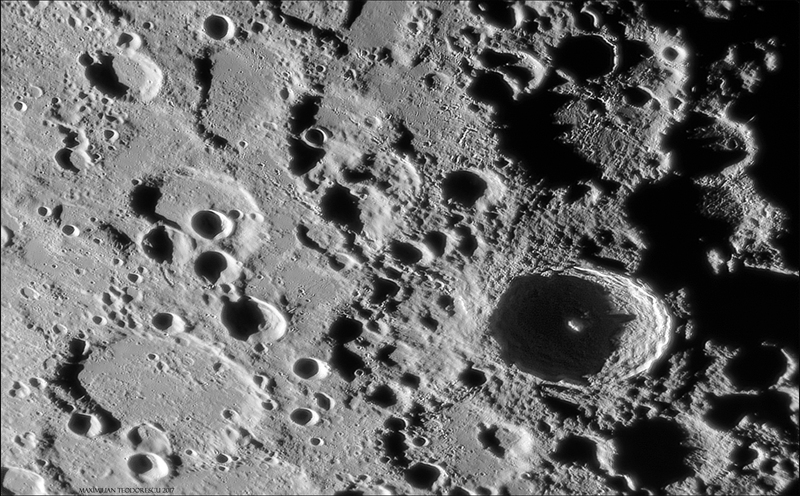 The shadows and complexity of the Alpes offer a striking view of the lunar surface at the eyepiece in any size scope. One image showing Ina volcano. This is my best view of this interesting feature yet. 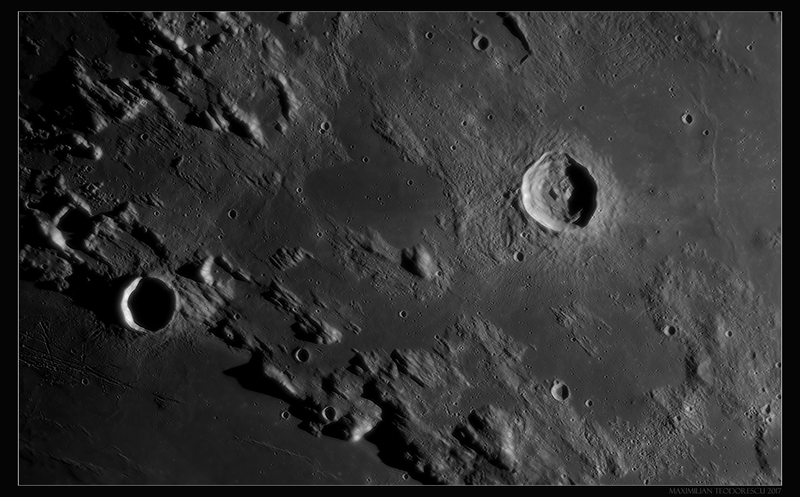 Craters Walther and Deslandres under very good seeing conditions. 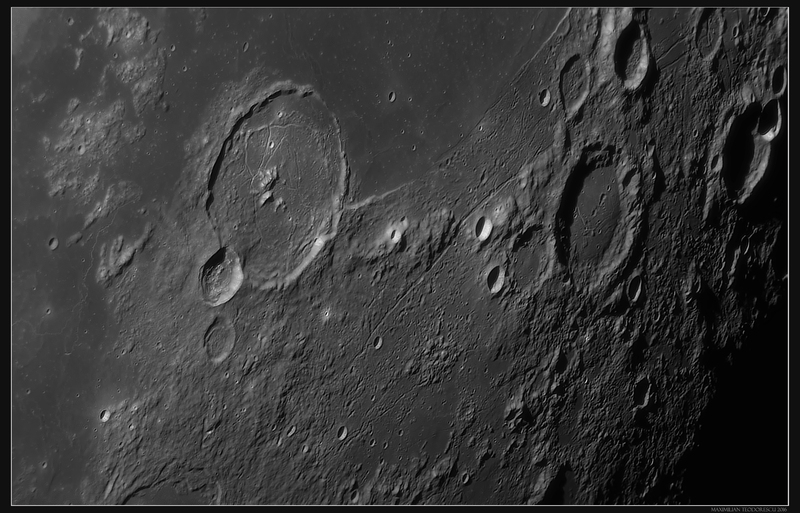 Some dew on the secondary mirror interfered with the acquisition, but in the end the result is worth posting. 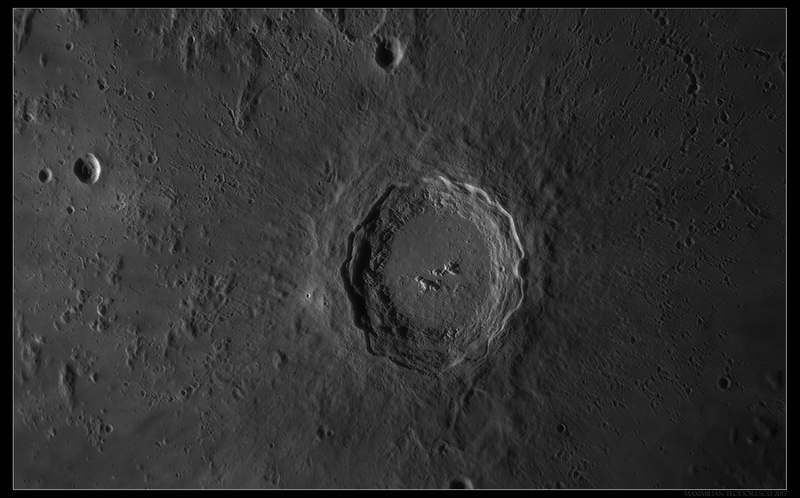 Crater Copernicus under a rather high illumination. Under this light the shadows are not quite yet dark, so details on the inner walls are still visible. 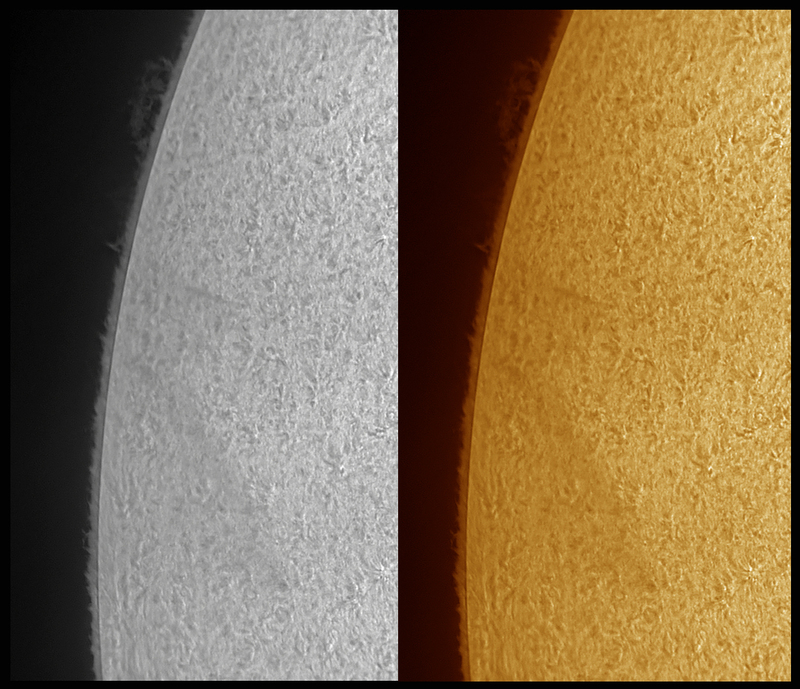 Some H-alpha shots from a quick session under rather good seeing conditions (considering the low altitude of the Sun). 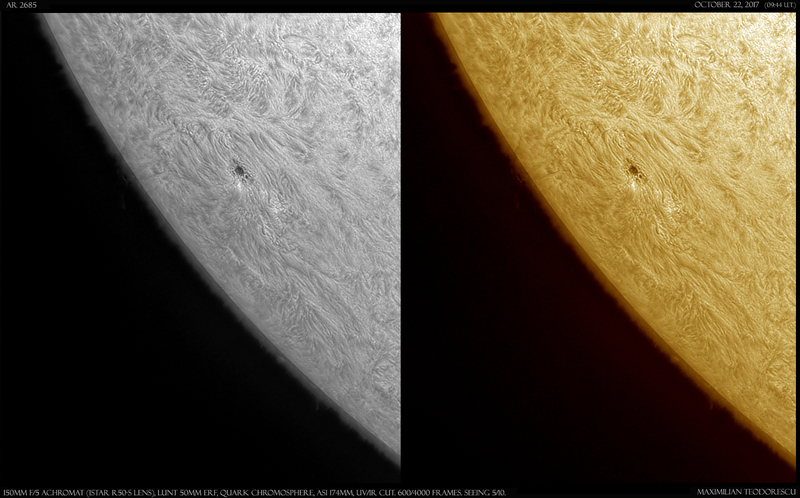 With the 115mm refractor, Quark filter and ASI 174MM camera.